An ancient shark called Carcharodon Megalodon (“rough tooth, big tooth”) had teeth measuring more than six inches long (the largest shark teeth ever found), jaws big enough to swallow an entire car, and a body the same length as tyrannosaurus rex. Some believe this shark may still exist in deep water… I for one welcome our new Carcharodon Megalodon overlords. A little known shark fact is that they have an acute sense of hearing. Some sharks can hear prey from up to 3,000 feet away. Measuring only seven inches long, the dwarf lantern shark is the smallest shark in existence. On the other hand, the whale shark is the world’s largest shark. It can grow to be 50 feet long and weigh more than 40,000 pounds. The Moses sole is one of the rare fish sharks cannot eat. When a shark bites into one, the fish releases a chemical that causes the shark release it. Scientists are currently attempting to recreate this chemical so they can use it to repel sharks from humans. 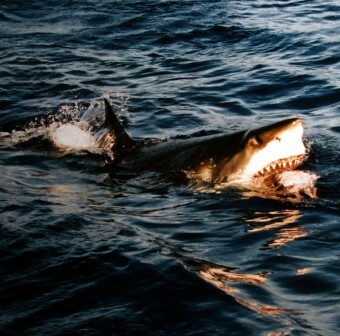 Most sharks must swim constantly to force water through their mouths and over their gills because they lack the ability to pump water over their gills like the majority of fish. Bull sharks can live in both salt and fresh water by regulating the substances in their blood. A Great White shark weighing 2,664 pounds and measuring almost 17 feet in length was the largest fish ever caught with a rod and reel. For every human killed by a shark, about two million sharks are killed by humans… We’re winning! Despite the fact that an almost equal amount of men and women swim in the ocean, men account for nearly 90 percent of shark attack victims. Sharks inhabited the earth 200 million years before the dinosaurs appeared and have changed only minimally during that time. Sharks do not have a single bone in their bodies. Their skeletons are made of cartilage. The few places they need somewhat stronger support structures such as their jaws, skulls, and spine, are fortified with calcium salts. #9 – “We’re winning”? How dare you encourage the destruction of an ecosystem? If sharks are removed from the oceans, the entire ocean goes out of balance & is irreparably damaged. How egotistical & shortsighted are you? Come on now Ginny, seriously? I never look at the comments but I did this time because I KNEW some over sensitive person that can’t take a joke would post something about that statement. Sure enough…. To hunt a specie to extinction is illogical – you can thank the dumbass ORIENTALS who think every exotic thing to them will help their 2″ pricks grow to 2.5″ And number 12 sure does help me believe in evolution. BWAHAHAHA!